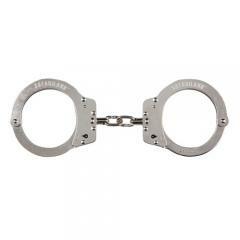 Secure and transport suspects with confidence using the Lightweight Steloy Chain Handcuff from Hiatt. Built to deliver unparalleled strength and durability, the cuffs are fabricated from a unique blend of steel and aluminum. As a result, they offer the unyielding strength of steel with a fraction of the weight. Each of the cuffs can be secured into place using a single swift motion thanks to their positive swing through action. Once the handcuff's arm has been set into place it is locked tighter than Alcatraz using 18 locking teeth and a 3-bar-retention mechanism that ensure it will only release when used with the correct key. The two hands are joined by a reinforced steel chain that ensures suspects retain minimal range of movement. Very impressive, light weight and smooth operation. Fit great in Binachi nylon covered cuff pouch. Fit a little snug in Safariland leather cuff pouches. So far I love them. Super lightweight. All metal design. No problems with rust or corrosion so far. I'm a Game Warden in South Louisiana and we are rough on our equipment. If I have any problems I will edit the review.